Dull Day | From the Seasonally Occupied Territories . . . Warning: This post contains no photos. Nothing much happens in it either. And on top of that, it’s two days late. O brave ones, read on . . .
Monday morning I awoke, as usual, a bit before six. Also as usual, I lay in bed a few minutes and watched the sun play in the skylight. The power flickered enough to reset the digital clock whose backup battery died a long time ago. No sooner had I gotten up and fed Travvy his breakfast than the power went out again. Turns out a car hit a utility pole on Old County Road, near Whippoorwill Farm. This explains the sirens I heard shortly after the power went out for good. The pole had to be replaced. That took a while. I lied. 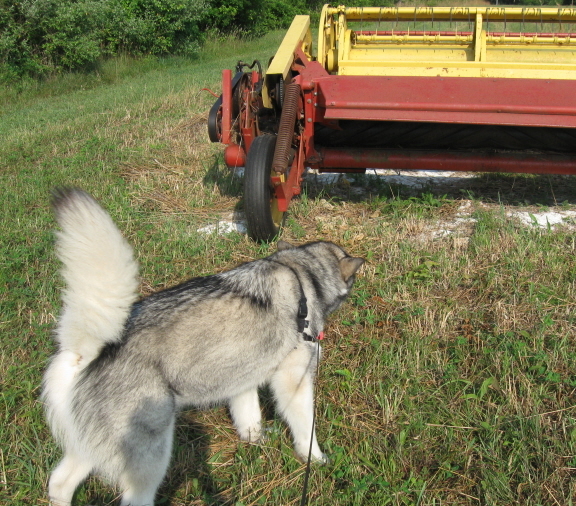 Here is a photo of Travvy wooing at a rake. It wasn’t on this particular walk, but it wasn’t long ago either. I didn’t learn this till mid-afternoon. By 6:30 it was pretty clear the power wasn’t coming back soon so Travvy and I left for our morning walk an hour earlier than usual. That, for the record, is the amount of time I spend most mornings catching up on e-mail, Facebook, and Scrabble games. Travvy wishes the power would go out every morning. The power was still out when we got back. No tea for breakfast, and no oatmeal. When my stomach started growling, I cut a slice of bread off the loaf in progress and garnished it with super-sharp cheddar. Not bad. My current rush job is on paper, so I took it — proofs, style sheet, Merriam-Webster’s Collegiate Dictionary (11th ed. ), The Chicago Manual of Style (16th ed. ), and a sheaf of sharp red pencils — out on the deck where the light was better. I still like working on hardcopy, but I have to admit that with my funky vision the infinite magnification possibilities of electronic editing are attractive. At 11:30 I packed up, gave Trav a peanut butter bone out on the deck, and set off for my lunch date in Edgartown. Date was with client-friend whose new book (which I helped edit) will be out very soon. At that point I will spill the beans. For now, suffice it to say that it’s a wonderful book and if you have any interest in Martha’s Vineyard whatsoever you absolutely must have it. Having strayed so far from bucolic West Tisbury (“bucolic” means there’s nowhere to buy anything useful), I figured I’d hit Oak Bluffs — groceries at Reliable, beer at Our Market — on the way home. I headed out of Edgartown on the Beach Road. Wow. Whole other world: cars forming a miles-long necklace by the side of the road. I actually spotted several specimens of Homo vacationens walking along the road wearing floppy hats and carrying coolers, umbrellas, and seating devices, headed for State Beach. Going to the beach! What a concept. I bought my groceries and my beer and headed home via Vineyard Haven, stopping at my vet’s en route to pick up a bag of Hill’s Prescription Diet T/D. “T/D” stands for “Tooth Diet.” Travvy gets ordinary Blue Seal dog food with a handful of T/D at each meal. Rhodry got it too and I’m convinced it’s the reason that he never had dental problems. It sure isn’t because I brushed his teeth regularly. I brushed his teeth once but we both thought it was stupid so I stopped. I’ve never tried to brush Travvy’s teeth. I made it through all three down-island towns in three hours, and that includes lunch. My neighbor got home the same time as I did: she’d taken her laptop to the West Tiz library so she could get her work done. In our absence the electricity had returned. Life is good. This entry was posted in Martha's Vineyard, work and tagged Edgartown, Rhodry, State Beach, summer, West Tisbury, West Tisbury Free Public Library. Bookmark the permalink. Seeing-eye dogs get their teeth brushed daily, from puppyhood. I learned this at a “graduation” ceremony at the Seeing Eye Dog “school” in Washington State. It’s a remarkable institution. I think I’ve still got the tube of chicken-flavored dog toothpaste I got when Rhodry was young and I was ambitious. For sure I didn’t use it myself . . .
“… cars forming a miles-long necklace by the side of the road”—magical words! I so wished I had my camera with me! I’ve got to go back some sunny day and take pictures. Those brightly colored cars looked like beads.